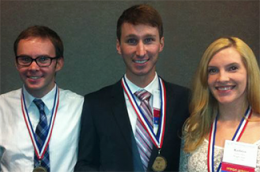 Medical students (l–r) Paul Blair, Tom Bacon and Kate Baker won the Doctor’s Delimma contest. Three fourth-year medical students of the Wright State University Boonshoft School of Medicine won the statewide student Doctor’s Dilemma® contest at the 2012 Ohio Chapter Scientific Meeting of the American College of Physicians (ACP) on Oct. 25, in Columbus. Tom Bacon, Kate Baker and Paul Blair competed against other medical student teams from Ohio University Heritage College of Osteopathic Medicine and Northeast Ohio Medical University. The Ohio chapter of the ACP awarded them medals. Doctor’s Dilemma® is a medical jeopardy competition. Each year, internal medicine residency programs throughout the state form teams to compete at the Ohio ACP conference. This is the first year the Ohio ACP has offered Doctor’s Dilemma® to medical students.